Nearly a year ago, Square introduced us to the next evolution of its payments product—Card Case. For anyone who has used and witnessed the app being used to actually purchase something (I have), the experience is pretty awesome. Basically it’s totally seamless, and you walk away feeling that perhaps this is the future of the way people will pay for goods in stores. Except, that Square is doing this now and actually growing in usage. Back in November, Square told us that 20,000 merchants had signed up for Card Case, and four months later that number has more than doubled to over 40,000 businesses using the loyalty and mobile wallet platform. For those of you who are unfamiliar, Card Case is a mobile app (iOS and Android) that you can fill with ‘cards’ of all the merchants they visit and buy from who accept Square. These mobile cards include locations, merchant contact info, coupons, photos, menus, comments and reviews from other customers, order and purchase history and more. The app also allowed you to create a tab at a restaurant under your name without having to pull out cash or a credit card, as the app has your credit card info saved. Square Card Case also includes a merchant discovery feature, that allows you to see a directory of merchants nearby your phone’s location as well as a list of the most popular spots that Square customers are frequenting. One of the killer features Square recently added was hands-free payments in the iOS app for Card Case. You can opt-in to a geofencing feature in the app, when you (and your phone) are within 100 meters of a Square merchant you can simple walk into the store, say your name at checkout and you are good to go with the payment. You don’t need to pull your phone out at all or open the app. On the backend, Square’s technology detects when you are near a merchant-enabled store, and the Merchant’s Square app will open a tab for the customer and show that customer’s account, name and photo as nearby. When the customer purchases an item, they say their name, and the cashier can verify that the photo matches the customer, and then press the transact button to send the charge through. The customer will get a push notification with the amount of the charge as well. The customer can also add a tip via Card Case after the transaction in case they forget. As I mentioned above, after using the entire experience (which so simple you almost feel like you are stealing), it’s hard not to imagine that this is the way we’ll pay for all goods in stores. The benefit for consumers and merchants is that it’s an extremely simple transaction—there’s no credit card to swipe, no receipt to sign, and no wallet to pull out. And this experience seems to be translating into meaningful revenue for some of the participating merchants using the mobile wallet. Some of the earliest businesses to accept Card Case increased revenue by nearly 25 percent as a result. And the trend is that Card Case users generally tip more using Card Case. Square doesn’t release the number of consumers using the app but says usage is growing fast. And of course the abundance of merchants on the app only helps boost consumer downloads, as the app becomes more useful. It’s important to note that Card Case is a separate application from Square’s payments app for the Android, iPad, and iPhone, which allows any business or individual to take credit card payments via a dongle that attaches to your phone. Square also offers Square Register, a high-powered point of sale replacement for cash registers and point of sale terminals. But in my opinion, what makes Card Case so compelling is what it represents for the payments experience as a whole. While Square hasn’t really talked about the big picture between Card Case and the payments app, it’s clear that the company is looking to address the payments needs of both sides of the counter. As COO Keith Rabois told us earlier this year, Square is going to add a number of new operational capabilities and data analysis to the register, including in-depth analytics on which inventory is selling well, and what they can do to help make more money. On the consumer side, Card Case is going to get more personalized. While Square wouldn’t go into any details on how personal the mobile wallet experience will get, you can imagine a merchant being able to serve personalized deals and offers to a customer based on previous purchase history or suggest items that the customer would enjoy. Basically, Square is tackling the entire spectrum of the payments experience, and it appears that data and personalization will be a big part of helping take this to the next level. That’s not to say that other payments companies and even merchants aren’t trying to solve this problem for merchants as well. Starbucks now allows you to pay for items via their mobile apps, which is similar to the experience of paying via Card Case. There are a number of startups such as Belly, Chatterfly, PunchTab and others trying to disrupt traditional loyalty programs for merchants and consumers. SCVGR spin-off LevelUp is also creating a payments and loyalty roll-up for businesses. PayPal is also looking to disrupt the mobile commerce and in-store payments experience, recently debuting point of sale integrations with Home Depot (with a number of other big box retail partnerships to come). Users can basically use their PayPal account to pay for items either by using a PayPal credit card or a special pincode. Eventually, it appears there will be a mobile payments component as well. 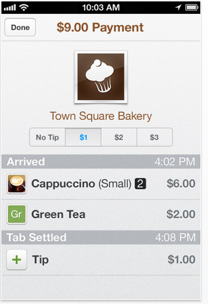 But whereas PayPal and Starbucks are targeting large chains and stores, Square has been focused on the small business. Since the inception of the company, Square’s CEO Jack Dorsey has always been steadfast on Square’s focus on helping small businesses and individuals take credit cards and provide a seamless payments experience. Currently, While PayPal is currently setting its sights on the big retailers, Square is looking to help drive more traffic to the small, mom and pop stores in your neighborhood. There’s definitely a place for a payments experience in the large retail world as well as the local business arena, but one thing that Square has to its advantage is that it is providing a connection between these businesses and potential customers that has never been in place before. Essentially, the company is empowering businesses with some of the technologies that big retailers have had access to for years. According to Square’s latest stats, over 1 million merchants are actively using the mobile payments platform to accept credit cards. The 40,000 merchants who are using Card Case as well as Square’s payments service is a small ratio but it’s clear the opportunity for growth is definitely there. I can imagine the company will have to begin more marketing and advertising to get adoption on both sides of the counter. Right now we have a glimpse into what Square could become for both merchants and consumers. When and if Square turns on features like analytics, personalization, inventory management and recommendations, we’ll see if the company can become the most comprehensive payments platform on the market.